Here is the definition of Depth of Field: the zone of acceptable sharpness within a photo that will appear in focus. In every picture there is a certain area of your image in front of, and behind the subject that will appear in focus. Have you ever seen a photo where the subject is perfectly focused and the background is blurred? That is an example of a shallow depth of field. When you see a picture and everything is in focus, subject and background that is a deep depth of field. Controlling DoF is an important step to mastering photography. 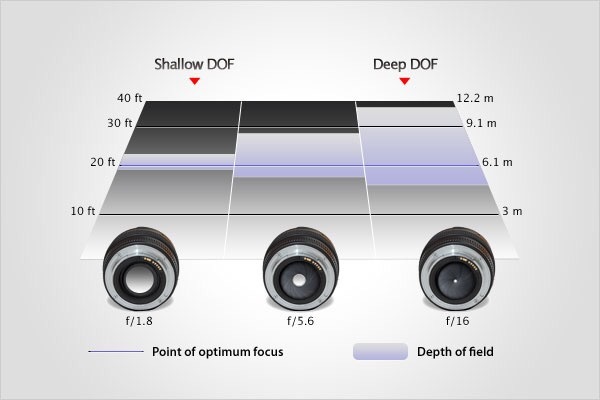 As you can see DoF increases the depth of the focal point as the Aperture gets smaller. Remember to balance Aperture with shutter speed and ISO. All of the model is completely in focus and the background is bokeh. Your eye naturally draws to her, not what she is standing in front of. Even tho the aperture is not as open as other photos it works. Why? Because the background, in this case was a building, was far away from the model. It only worked because the building was far. It it was closer, I would of had to increase the aperture size to give that bokeh affect. Now the closest light is in focus and the model behind it is blurry. It makes for a great feel in the photo. That is all there is to it! Just play around with it. Focus on something other than the models eye and see what the picture looks like. Then play with the settings a little bit more.